Bint Bint Nadafi is a 1997 chestnut Straight Egyptian Arabian mare coming from a family of many champions, through both her sire and dam line. “Her sire, Thee Desperado, is a champion in the showring himself and a sire of champions. Thee Desperado was Canadian Nationals Top Ten (twice) stallion, US National Top Ten stallion, and Reserve US National Champion stallion. He is the sire of Rhapsody In Black, dam and grandam of champions. 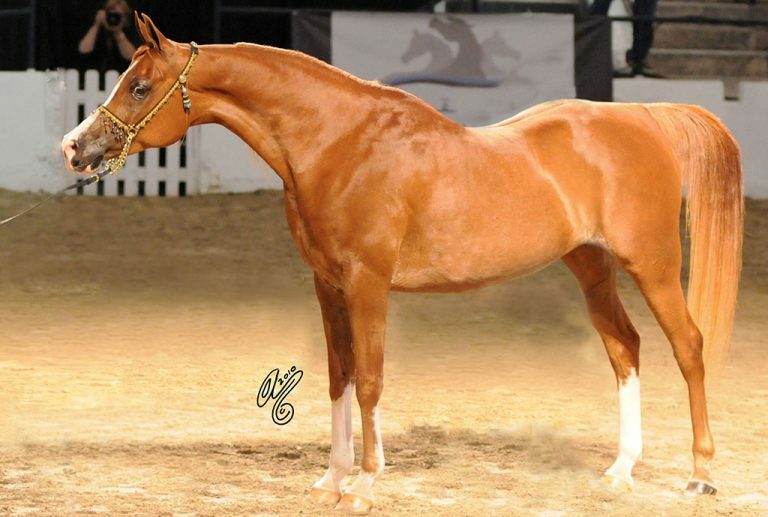 He is also the sire of The Vision HG, an Israeli National Champion mare (twice) and dam of All Nations Cup Reserve Junior Champion, Top Five at the World Championships, Israeli Reserve National Champion stallion, Gold Champion colt at Dubai International Championships, Gold Champion colt at the Sharjah International Show, and others. Bint Bint Nadafi’s dam is Bint Nadafi, a TheEgyptianPrince daughter. TheEgyptianPrince is in the pedigree of many world reknown horses as he is the maternal grandsire of Star Bint Hafiza (dam of Makhnificent KA), Belle Star (dam of The Vision HG), Shaamis Amira (dam of champion mare TF Shahraaz who is a Champion in both the USA and Europe) and he was also the maternal grandsire of Thee Desperado and PVA Kariim. The maternal grand dam, Nadafi, is also the maternal grand dam of Crusader, Nations Cup Reserve Champion stallion, British National Champion, and World Reserve Senior Champion stallion. Bint Bint Nadafi is a ¾ sister to the stallion, Amir Amante who is the maternal grandsire of US Egyptian Event Reserve Supreme Champion stallion, Paladium (now exported).” -Pedigree Research copyright by Brandye Smith, Hopes & Dreams.